The ball goes to the site of the controversial Moses Mabida soccer world cup stadium construction in Durban to check the progress or, as sometimes happens because of worker strikes for better, the lack thereof. It then rolls off to the historical Early Morning Market to do a spot of vegetable shopping. On the way we see the heady cultural mix and urban diversity of this sub-tropical seaside tourist attraction. To its dismay the vendors at the market are being evicted to make way for a shopping mall to be built in time for the 2010 Soccer World Cup. 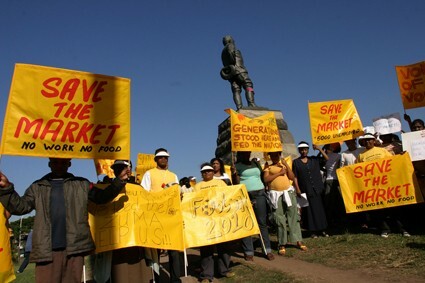 ‘The 2010 mall will starve us all’ and ‘In the market R50 will fill your basket, in the mall you’ll get fuckall!’ read the protestors signs. We follow the ball, as it becomes the accidental participant in this market’s struggle for survival. We meet Vinesh a trader at the market who has unwittingly assumed a leadership role in this saga, a man of generous spirit and firm resolve who celebrates Nelson Mandela’s birthday by giving free fresh vegetables to all and sundry. Vinesh is also a soccer coach and the Footsak team explores the Indian township of Phoenix through the coach and players.